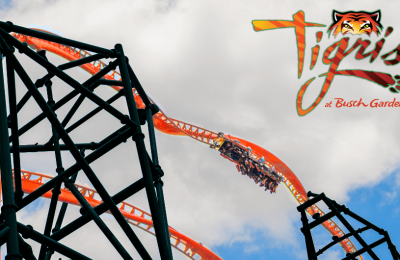 Members of the media were invited Thursday and Friday to take a sneak peek at the still, very under construction new coaster and animal interaction experience for 2011 at Busch Gardens Tampa. Cheetah Hunt continues the tradition started with attractions like Manta by mixing unique animal interactions with state of the art thrill rides. We donned some snazzy hard hats and took a look around. First stop is the building formerly known as the Clydesdale Hamlet. For many years this was home to the Busch Gardens Clydesdale horses that were a signature symbol for the company the park represented. Now these stables are being refitted and rethemed to house the 12 big cats that will call the attraction home. The stables, once a favorite of guests will be off limits to the general public. The areas feature doors that will easily allow the trainers and keepers to move the animals in and out, and from each room. The area will eventually house 14 cheetahs in 7 rooms. Like Jungala across the park, the cheetahs will be free roaming for all to see. On top of being an area to look at the world’s fastest land animal, Cheetah Run will also be where guests can see the animals doing what they’re known for, running. Several times a day the animals will provide in an area just about the size of a football field. The Cheetah’s will Run (see the clever name there) at speeds up to 50 M.P.H. The outside of all of the buildings for Cheetah Hunt and Cheetah Run will be decorated with specially designed set pieces. The outside of the coaster building will also feature two “drift-wood” sculpted Sentinel Cheetahs. These are pretty much the spirits that over look the ride as you feel the spirit move you. Inside of the coaster building will be a huge Cheetah sculpture that is now just a twist of bars and metal beams. The coaster will take over three areas of the park. Of course the old stables will be used as housing for the Cheetahs in Cheetah Run while the river portion for Rhino Rally has been drained and re purposed for a portion of the track to sneak through. And the station will share the same building as the Skyride. What was once Busch Gardens hanging monorail will now be the station for Cheetah Hunt. 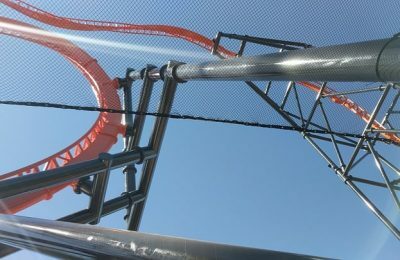 The coaster itself will have three launches, the first of which being directly out of the station where it will shoot out at around 38 mph veer left and down into a trench. That trench is where launch two takes place and will shoot the train out and up at 60 mph and 100 feet up to the tower and the figure 8 where you will get a look of the park before hurtling down 120 feet into another trench through a corckscrew, over the skyride and into the area that used to be the Rhino Rally water portion. 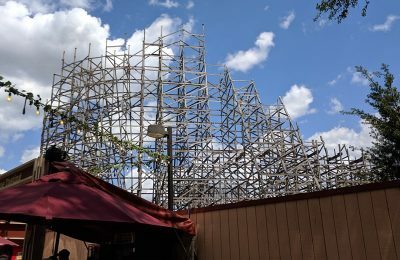 If you don’t want to ride, but want to get a good look at the coaster, there will be several points where the coaster passes very close to onlookers. There will a bridge that gets you close to the action where you can see the first launch, plunge and second launch. The coaster will also go over the pathway near Edge of Africa. The cheetahs are especially being looked after, as the trenches will serve as barriers between the coaster and cheetah run areas. As you have probably heard by now the attraction will be open May 27th, Memorial Day Weekend. If all goes well, the track should be completed within the next few weeks, and the coaster will power up on March 1st. The first of the coaster trains should also be on site next week as well. If it follows Manta’s model (which right now it seems to be) we may see the trains testing the first part of April, and could see a soft opening for limited times the first week of May. For more information on Cheetah Hunt and Busch Gardens including tickets, visit the official website. Previous PostKeepers Tales-A trip to the Pirates Tavern Next PostDisney's Next Generation System-Is it a good idea?